Akemi Kakihara is a Japanese pop star who has released 14 albums with EMI Music Japan, one of Japan’s major record labels. Her latest album, Say That You Love Me, came out in August 2010, and her two most recent US singles appear on compilation albums. But she’d rather talk about the children. The children are preschoolers in Miyagi and Fukushima, where AK (as she prefers to be called) visited six months after a massive earthquake triggered a tsunami in Northeastern Japan on March 11, 2011. When she arrived at the school in Soma, a small town near the coast of Fukushima approximately 30 miles north of the Fukushima Dai-ichi Nuclear Power Plant, she was shocked by what she saw. She was even more surprised when she entered the school. She found a room filled with happy, smiling children, grateful to hear her sing. These children were four and five years old and had survived the worst natural disaster to strike Japan in 140 years. They were living in shelters. Some had lost one or both of their parents to the disaster. Yet they couldn’t have been more attentive or appreciative. On March 11, 2011, AK was in New York City, where she has called home since 2001, watching in horror as the black waves crashed over the floodwalls and raced inland, eating the shoreline and destroying buildings, cars, and lives. As a native Japanese, AK was heartsick over what was happening to her homeland; as a native of Hiroshima, she felt an even greater connection to Fukushima, where the nuclear power plant had been compromised, triggering a nuclear crisis. Feeling the need to help, AK immediately rallied her circle of friends – around 15 close-knit Japanese women living in New York – to form the Facebook group JP Girls NYC Save Japan with Your Love. They started in Times Square and moved to Grand Central. Then AK and the JP Girls learned about New York’s permit requirements. “We didn’t [get a permit]. It’s impossible, by the way,” AK says, laughing. 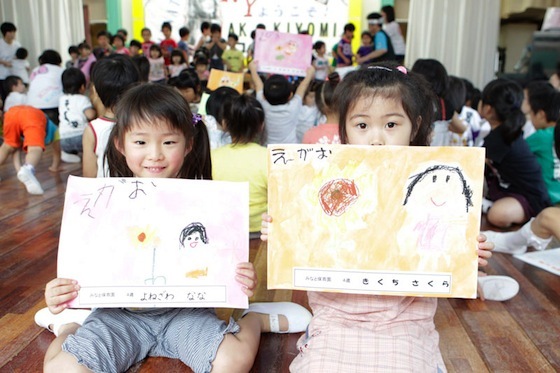 Through the initial help of the Lion’s Club, the JP Girls were able to secure the permits necessary to hold several events and raise money, which they donated to the Lion’s Club, the Red Cross, and Japanese organizations such as Ubdobe, Megumi-Japan, Miyagi Kodomo Network, and Kodomo Fukushima. Organizing these fundraisers was satisfying for AK, partly because she didn’t expect the overwhelming support from New Yorkers (“I realize that they love Japan,” AK says, “and I’m very happy to know that.”). But she wanted to do more. She decided that she needed to go to Northeastern Japan because she wanted to assess the damage with her own eyes. Watching the stories on the news wasn’t enough; she wanted more detailed reports. And that’s how she met the preschoolers in Soma. After the concerts each of the children presented AK with drawings they made themselves as way to thank her for her visit. There were 93 drawings, and all of them had smiling faces. Touched by this gesture, AK made copies of the drawings and used them to create holiday wrapping paper, which she sold at Kinokuniya, Scribble Press, Kiteya SoHo, Taro’s Origami Studio in Park Slope. Her purpose in selling the wrapping paper was to start conversations about Fukushima and to raise awareness about children living close to a nuclear power plant, whether in Japan or other areas around the world. 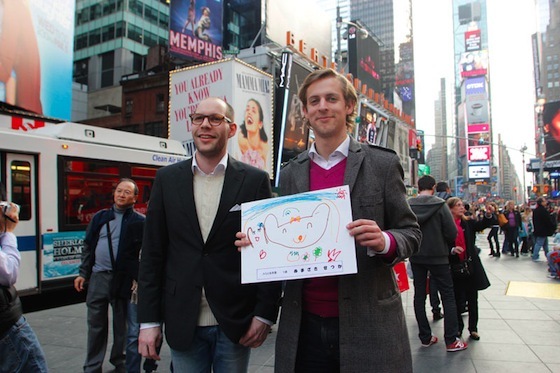 As a way to thank the children from the preschool in Soma, AK took the 93 drawings to Times Square and asked random strangers to pose with them. AK took a picture of each person and sent the photos to the preschoolers as Christmas presents. At the Japanese American Association and the United Nations International School, she presented “Voices of Tohoku,” an exhibition of the drawings and a slideshow of her experience. “I felt a mission,” she says. 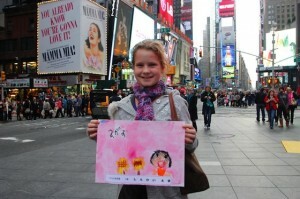 “I had to spread the word” about the children of Fukushima. In addition to her work as a singer, AK continues to focus on the children of Northeastern Japan by thinking of creative ways to use the drawings and by participating in events around New York, including Japan Society’s Open House on March 11 of this year, where she’ll display twenty or thirty of the drawings, perform with children, and participate in HappyDoll’s doll-making session. She’s working on collaborations with other local organizations to commemorate the one-year anniversary of 3/11. She’s also planning another trip to Northeastern Japan in April, visiting more schools and performing more concerts. With all of the support that AK is giving to Japan, she maintains that she is the one who truly benefits from this outreach. As devastating as the events of 3/11 were – and continue to be – AK says it brought the Japanese community in New York together. And, of course, connecting with the preschoolers in Tohoku has given her a sense of purpose.